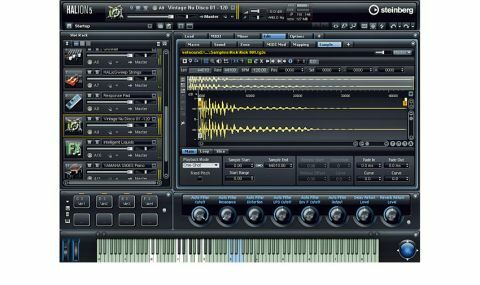 A hugely powerful soft sampler/synth, now with user-friendly instruments, macros and even more synthesis options. Stable and reliable. Granular goodness. Incredibly deep editing. Super-flexible interface. Some stunning presets. Sparse scale/tuning options. Recycles a lot from other Steinberg titles. Model C can be used to call up a swell of sampled tonewheel goodness. Organ grinders rejoice! Steinberg's high-powered HALion 5 VST/AU sampler continues to pile on improvements where the generally underrated HALion 4 left off. A MIDI Player module is now built in to play back MIDI files, and the phrase-generating FlexPhraser module (ported from Yamaha's Motif keyboard series) now has a super-fun 'user mode' for developing fresh, inspiring musical ideas. Version 5 adds nine effects, a new sample slicing mode and over 1000 new sounds via eight new instrument interfaces. These are really just user-friendly front end "macros" that put the most relevant of HALion's controls for the sounds they deal with immediately to hand. Essentially, they're the equivalent to Kontakt's KSP scripted interfaces, except that with HALion, you can't make your own (yet). The new World Instruments module accesses 50-odd instruments in the Ethnic category, further split into Latin, European, African and Asian sub-categories, through a hippified interface featuring an Oriental Scale mode, which basically flattens selected notes by a quarter-tone. "Presets are amongst the best sounding we've ever heard from a sampler/ROMpler"
Like all the new instruments, this one certainly speeds up workflow, and its presets are amongst the best sounding we've ever heard from a sampler/ROMpler, although we can't help but wish there were more detailed scale and tuning options on board. It would be nice to be able to call up a simple 24-note octave, for example. The World Percussions set impressed us just as much, boasting 32 patches' worth of professional percussion loops and one-shots from around the world, with enough controls on the interface to enable tweaking of all essential timing- and tuning-related parameters. Still on a rhythmic tip, the new B-Box interface connects with the Beats sub-category and takes advantage of the new Drum Player MIDI module - essentially a step sequencer for crafting funky beats, not too dissimilar to Beat Designer, found in Steinberg's well-known Cubase DAW. Making the virtual analogue synthesis engine introduced in HALion 4 much easier to handle, HALion 5 adds the Voltage and Trium instruments. Again, these are just macro interfaces with which to edit or program synth patches using the existing under-the-hood engine in a faster, more intuitive way than the previous modular setup offered. "Macro interfaces use the existing under-the-hood engine in a faster, more intuitive way than the previous modular setup offered"
Sonically and feature-wise, both resemble Steinberg's Retrologue, except that Trium boasts three oscillators and Voltage doesn't have oscillator unison, multimode filters or ring modulation. Trium also offers considerably more sub-oscillator waveforms, filter types and distortion modes than Retrologue, and both Trium and Voltage have their own arpeggiators, whereas Retrologue doesn't. That puts Trium at the top of Steinberg's virtual analogue synth tree - and yes, it definitely sounds good enough to compete with most of the other virtual analogue synths on the market. If you're a fan of really retro sounds, HALion 5 also includes the HALiotron instrument, which emulates that tape-based classic the Mellotron. It includes seven basic sounds: a choir, two clarinets, brass, bassoon, strings and our personal favourite, flute - famously used on The Beatles' Strawberry Fields. The new effects in HALion 5 comprise VST Amp, Wah Wah, Tape Saturator, Octaver, Ring Modulator and Envelope Shaper - all adapted from their Cubase counterparts - plus AutoFilter, Step Flanger and Vintage Ensemble. These all make great additions to HALion's already impressive repertoire of effects. HALion 5's other big addition is a pair of new Zone types: Grain and Organ. Organ is covered in Model C, but Grain gives HALion users a whole new way of manipulating samples, based on the granular synthesis engine found in Steinberg's Padshop product line. This is one seriously cool addition to HALion's sound- shaping arsenal that increases its reach into the future with the ability to turn abstract samples into fascinating ambient textures and post- modern pads. Highlights include up to eight grain streams and the ability to add independent random fluctuations to the grain position, duration, pitch and pan position. "Auron makes getting into the exciting world of granular synthesis an absolute doddle"
What makes it all the more fun is its front end macro instrument, Auron, which, while not quite as powerful as Padshop, makes getting into the exciting world of granular synthesis an absolute doddle. The resulting sounds are otherworldly and intriguingly organic. Of course, if you're already a Padshop Pro user, Auron won't be such an attractive feature, but its position within the broader HALion 5 engine makes it easy to blend with other sounds, which is a definite plus. HALion 5 represents another big stride forward for Steinberg's sampling workstation, and the emphasis remains firmly on workflow and quality sounds. Whether you're primarily looking to process loops and samples you've found or created yourself, or you're after a hot and highly customisable ROMpler-style library to power any kind of production, HALion 5 is up to the challenge and unlikely to disappoint.